It was common for the federal government and religious institutions to remove young Native Americans from their families and placed them in Indian boarding schools far from home. Hundreds of these schools operated in the United States from the late 1800s through the 1950s. Indian schools proliferated after Army officer Richard H. Pratt, who worked with Apache prisoners in St. Augustine, Florida, convinced the U.S. Congress to give him funding and use of deserted army barracks to operate boarding schools for Indian children. Pratt believed that removing Indian children from their culture and subjecting them to strict discipline and hard work would force their assimilation into mainstream society. Congress' support was based on cost. It was also thought that the U.S. Army could save the thousands of dollars it took to kill an Indian by forcibly changing young Indians into ‘Americans’, which would cost only a few hundred dollars. Needless to say, many Indian students did die, and many more were physically and mentally maimed for life. 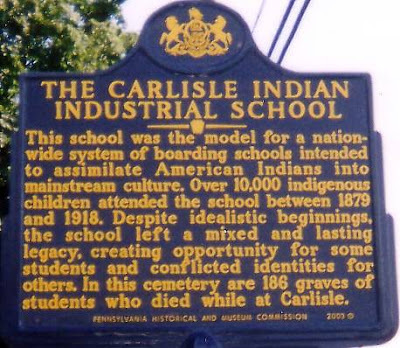 At the Carlisle Indian Industrial School in Pennsylvania alone, there 186 graves of Indian children. 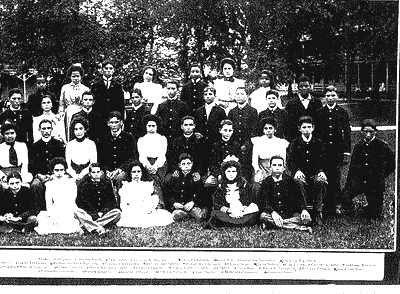 Surprisingly, many students from Puerto Rico and Cuba were also enrolled at the Carlisle and other U.S. boarding schools. It was part of a U.S. program following the Spanish American War of 1898 to "Americanize" the populations of Puerto Rico and Cuba. Educator and author Sonia M. Rosa discovered this forgotten part of American-Puerto Rican history and has written about it a paper titled The Puerto Ricans at Carlisle Indian School. It's a short but fascinating study of the Puerto Ricans at the Carlisle Indian School, a group of young Boricuas which came to be known as the Porto Rican Indians. Wow.... Unfortunately, it's worse, the closer we look. :( Please keep looking.... Thanks for sharing, brother. How is it possible there 100% Tainos alive in Puerto Rico after 1898 when Juan Ponce de Leon massacred them between 1511 to 1515? Great article. We should readily refuse to forget. Who said our future is in the past? This couldn't be truer! A GOP Edge for '08? Is the GOP Doomed in '08? Hillary 'Milhous' Clinton on Track to Win? Shock Jocks' Anti-Latino Bigotry: Smart Business? African immigrants make the smartest Americans? A Failed War -- A Failed President? We, The Taíno, are the 1st Americans! U.S. losing global grad race? PR Education Department: An Oxymoron? Who Won't You Vote for in 2008?